This audio series is provided in downloadable format. It consists of 32 sessions (one introduction session plus 31 sessions corresponding to the 31 chapters of Proverbs. A downloadable Study Guide is also included. Gain fresh understanding as you listen to Dr. Rohm share from his favorite book in the Bible. 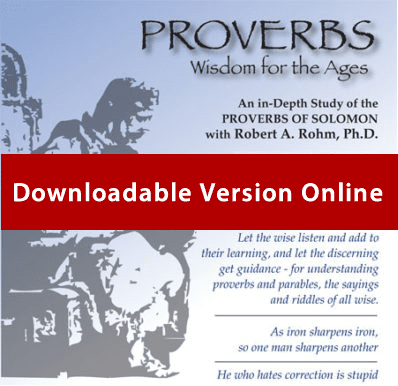 Dr. Rohm uses the NIV Bible to explore the ultimate book of wisdom. Experience insights that are more relevant than ever. After you purchase this, you will be able to download the zipped (compressed file) containing all the audio files and the study guide). Please allow for some time for this file to download as the file is over 600MB. After you download the file then locate the file and “unzip” it (decompress it) to see all the audio files and study guide. You may need to “right-click” on the downloaded file to see the option to unzip/decompress/extract the files.